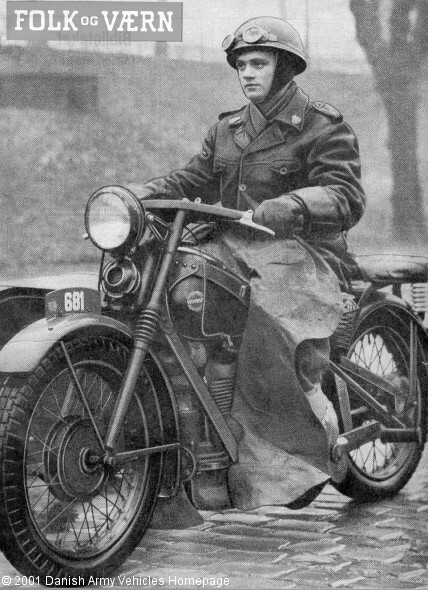 Danish Army Specific: Nimbus Model C was build by Fisker & Nielsen in Copenhagen and delivered between 1934 and 1960 with and without sidecar. Sidecar-versions included ammunition carrier (98 kb), ambulance (70 kb) , 8 mm machinegun (33 kb), 20 mm machinegun (157 kb) and with radio (94 kb). The Model C appears to have been in the Danish inventory as late as in 1970. Replaced by the BSA B40WD in 1968. Historical: Shown model was introduced in 1934, ahead of it´s time with overhead camshaft, automatic advance ignition and a telescopic fork. Approx. 12.000 had been made when production ceased in 1960, of which approx. 2.400 were delivered to the Danish armed forces. In 1936 attempts were made to sell Nimbus outfits, in combination with the 'System Madsen' weapons, to Chiang Kai-Chek forces in China and to the Brazilian military. Neither attempts came to anything, but in 1940 100 army green Nimbuses were bought by the Yugoslavia, which was promptly overrun by German forces, before deliveries could take place. Those 100 were eventually used by German forces in Norway, and it is believed that a large number - possibly 70 - of Danish Army Nimbuses were used by Danish nazi volunteers fighting on the Eastern Front. Weight: 185 kg (407 lb) solo. Engine: Own 4-cylinder, 0.746 cm3 (45 cubic inches) displacement, air cooled, carburetor. Horsepower: 18 at 4.000 rpm (early), 22 (from late 1930´s). Fuel capacity: 12.5 liter (2.75 gallons). Crew: 1 + 1 (solo). Additional: Shaft drive, riveted steel strip frame. Thank you to Kim Scholer, former editor of "Nimbus Tidende", for the main part of information given in the "Historical"-section.